Rheumatic fever is a serious illness. It often starts with a sore throat. Without treatment, some sore throats can cause rheumatic fever which can lead to heart damage. The content on this page is for parents/caregivers of children with rheumatic fever and rheumatic heart disease. For information about preventing rheumatic fever, see Sore throat on this website. Rheumatic fever is a serious illness that can cause damage in your child's heart as well as swelling and pain in their hips, knees, ankles, elbows, wrists. You may also notice a skin rash, fever or jerky movements. Over time, most of these symptoms will go away but any damage to your child's heart may be permanent. How did my child get rheumatic fever? Rheumatic fever often starts with a sore throat caused by strep bacteria. Without treatment, the strep throat can cause rheumatic fever. Rheumatic fever can damage your heart. This is called rheumatic heart disease. 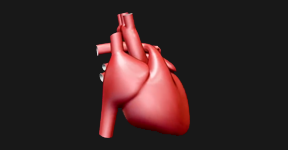 The heart is a pump with 4 chambers (rooms) and 4 valves. A heart valve acts like a one-way door. It makes sure that blood pumped by the heart flows in one direction only. If rheumatic fever damages the heart valves, this is called rheumatic heart disease. When your doctor listens to your child's heart, they may hear extra sounds called murmurs. A murmur is the sound of some blood flowing the wrong way through a leaky valve. Watch a series of animated videos about rheumatic fever and the heart. Not everyone with rheumatic fever will have heart valve damage, but people with badly damaged heart valves may need heart surgery. During your child's stay in hospital, they will have many tests. These include blood tests and an echo scan (echocardiogram) to check on your child's heart. The treatment for sore joints is rest and pain relief. Your child will have penicillin to get rid of the strep bacteria. They will have their first penicillin injection before leaving hospital. Depending on your child's symptoms and test results, they may need to stay resting in hospital for some weeks or months. Children with badly damaged heart valves may need heart surgery. What happens when your child goes home? It is very important that your child doesn't get rheumatic fever again. This can cause more damage to their heart. Your doctors will let you know how long your child will need to rest when they go home. As soon as your doctor says it is safe for your child to be active again, it is important that they start exercising regularly and lead a healthy lifestyle. With proper care and regular penicillin injections, most people who have had rheumatic fever lead a normal life. Penicillin is the best antibiotic to prevent rheumatic fever. If your child is unable to have penicillin, your doctor will discuss another treatment with you. It is very important that your child doesn't get rheumatic fever again. Every strep throat can lead to rheumatic fever, which can cause more damage to their heart. To stop your child from getting strep throat, which can cause rheumatic fever again, make sure they have regular penicillin injections. Talk with the nurse about arranging your child's penicillin injections, to see what may work best for you. How can your child avoid getting rheumatic fever again? 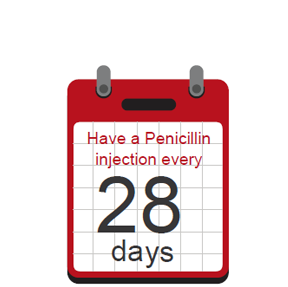 Your child will need a penicillin injection every 28 days. 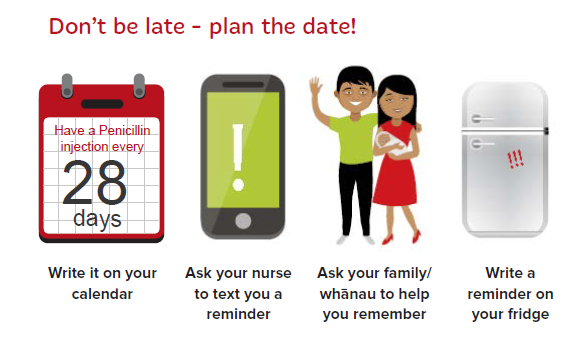 The best way to prevent rheumatic fever is to make sure your child has regular penicillin injections on time. Penicillin kills the strep bacteria that trigger rheumatic fever, stopping any further damage to your child's heart valves. Penicillin injections can be painful. Nurses can use numbing medicine (local anaesthetic), distraction techniques and other ways to minimise the pain. The nurse may come to your home or your school clinic to give the injection. There are also community nurse clinics available. How long will penicillin injections be necessary? See tips for making penicillin injections more comfortable. Your child will need to have injections every 28 days for at least 10 years, or until they are 21 years old, whichever is longer. In some cases, particularly if your child has heart valve damage, they may need to continue penicillin injections for longer. Never stop penicillin treatment without discussing it first with your child's doctor, as your child could get rheumatic fever again. This can cause more damage to their heart valves. Remember to tell your child's nurse if you are moving house, going overseas, on holiday, or going away. Your child may need to get their injection early, or their nurse may be able to arrange for them to receive their injections elsewhere. If you forget an injection, ring your nurse to arrange to get the next injection as soon as possible. Why do you need to tell people that your child has had rheumatic fever? Tell every doctor, dentist or dental therapist that your child has had rheumatic fever. Heart valves damaged by rheumatic heart disease can occasionally get infected during certain types of operations and dental work. Your child may need extra antibiotics to help protect their heart. This is why it is important to remember to tell every doctor, dentist or dental therapist that your child has had rheumatic fever before they have any medical procedures or operations. Ask your doctor for a copy of a rheumatic fever wallet card. It has important information about your child's rheumatic fever. You should show it to any dentist, dental therapist or doctor before they treat your child. Everyone has tiny bugs in their mouths. These bugs are usually harmless, but sometimes when the dentist is working on your child's teeth, the bugs can get into their bloodstream. If they reach your child's heart, the bugs can cause more damage to the heart valves. This is called endocarditis. The Paediatric Society of New Zealand is grateful to the Heart Foundation for providing the content for this page. The booklet 'Rheumatic fever and rheumatic heart disease' was revised in November 2016. The video is copyright Kylie Sullivan 2017. Licensed under a Creative Commons Attribution-ShareAlike 3.0 Unported License. Acknowledgements: Starship Child Health, Starship Foundation, Auckland District Health Board (Alison Leversha, Faith Mahony). Some answers to questions your child might have about their penicillin injections after they have had rheumatic fever. As a caregiver or parent it is important you take a few deep breaths and relax yourself, because if you are feeling very afraid and upset then your child will find the experience more difficult. A checklist to help you with your child's rheumatic fever treatment. If you have had rheumatic fever or rheumatic heart disease, you should have a heart check-up before you fall pregnant. This booklet is designed for parents/caregivers of children with rheumatic fever and rheumatic heart disease. It answers commonly asked questions about the illness, the care and treatment your child will need and how to prevent future attacks. Every week, 12 babies are born with a heart defect in New Zealand. Whilst there are surgical procedures that can improve the heart's function, there is no cure for a congenital heart disease (CHD). 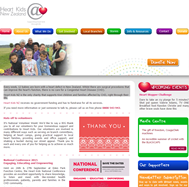 Heart Kids NZ is a charity that supports Kiwi children and families affected by CHD, right through their life. Phone 0800 KIDZ HEARTS (543 943) or 64 9 377 9950. This page last reviewed 07 September 2017.